NEW YORK -- Mark Messier doesn't have a guarantee this time. "I would have absolutely no idea what I'm going to be able to accomplish in 26 miles," Messier said Thursday in Central Park at a press conference for Sunday's ING New York City Marathon. "If I was able to do it anywhere around four and a half hours that would probably be a success. I guess a success would be finishing it, but I don't really know." When Messier issued his guarantee prior to Game 6 of the 1994 Eastern Conference Finals, he did so as a five-time Stanley Cup champion and the captain of the New York Rangers. He at least had a clue about what he was guaranteeing. "I wish I was 35 or 40 years old running it and not 50, but I think in the end it's challenging yourself to do something and get outside your comfort zone. In that regard I'm really challenging myself to do the best I can personally, and I think that's what running really is, it's about your own personal journey." This week, Messier is just like the two stars that sat beside him at Thursday's press conference inside the Marathon Pavilion, only a short distance away from the finishing line. Apolo Ohno, Jennie Finch and Messier are world-class athletes in their respective sports, but none of them have ever run a marathon, let alone one that will take them on a 26.2-mile journey through New York City's five boroughs. "Every athlete at some point realizes what this is all about, and it's usually on marathon day," said Mary Wittenberg, the President and CEO of the New York Road Runners, the organization responsible for putting on the ING New York City Marathon. "After having spent time with Mark a few weeks ago, he already gets it." If Messier was shooting for a goal he could try to target former teammate Mike Richter's finishing time of 3:54:34 in 2007, but Richter ran the New York City Marathon as a 41-year-old. Adam Graves' finishing time of 4:27:32 as a 38-year-old in 2006 may be a more realistic benchmark for Messier, who is trying to run his first marathon at 50. Pat Lafontaine also finished the New York City Marathon in a time of 4:27:08 two years ago. He was 44 at the time. "I wish I was 35 or 40 years old running it and not 50, but I think in the end it's challenging yourself to do something and get outside your comfort zone," Messier said. "In that regard I'm really challenging myself to do the best I can personally, and I think that's what running really is, it's about your own personal journey. "You really have to go through the process yourself and figure out what works for you to do something of this endurance." Messier had no experience as a distance runner prior to embarking on his journey to Sunday's big race, but someone suggested to him that running the marathon would bring more attention to his two charities -- Tomorrows Children's Fund and The New York Police & Fire Widows' & Children's Benefit Fund. He'll be running in support of both on Sunday. "It was leading up to the 10-year anniversary of 9/11, that's where it all started," Messier said. "I tried to do some things where I was looking for support from other people. It didn't go through and that was very disappointing. But then I turned to myself and said I have to do something for myself. What could that be? I didn't see myself running a marathon two years ago or even a year ago, but I am sure glad it has turned into this because it has been quite a journey both physically and emotionally. I'm really glad I'm doing it and I think it is for a great cause." Messier has said repeatedly that he's enjoyed the meditative aspect of running because those long training runs in his hometown of Greenwich, Conn., have given him the freedom to reflect back on his life and career. He found inspiration in an article he read in Runner's World Magazine on Frank Shorter, one of running's most legendary figures and a gold-medal winner at the 1972 Summer Olympics. Shorter grew up with an abusive father and used running as his escape outlet. "I think running can be that for a lot of different people, and that was inspiring to read that article," Messier said. "I took that and translated that into my own running to feel I could keep going even when the days got tough. Everyone always needs to be inspired, and certainly reading that article was a real wakeup call for me." His next wake-up call will come Sunday, when he "pounds the pavement" through New York City. About the only guarantee Messier will give now is that he will be there at the starting line. 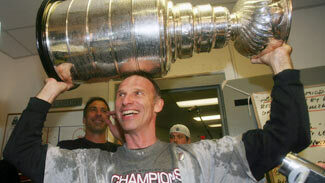 "I guess you have to get in there, get running and feel the spirit of the crowd," Messier said. "I'm looking forward to seeing how well I can do, and of course I will try to do the best I can, run the fastest time I can."